The second in the Big Finish Blake's 7 trilogy by Paul Darrow picks up where the first left off, telling of a Federation leadership that has become a squabbling Quartet. Avon is on the run with Orac and each of the Quartet would like to get hold of it, or at least stop the others doing so, and if that means destroying it and killing Avon, then so be it. 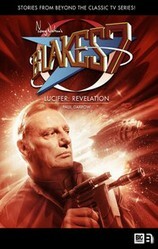 After the very mixed reaction to the previous Blake’s 7 book by Paul Darrow (who played Avon in the original BBC TV series), Big Finish has decided to risk a second – Lucifer: Revelation. As the title suggests, this is a sequel to Lucifer and is planned to be the second book in a trilogy. An ongoing problem with Paul Darrow’s writing is the frequency of basic scientific mistakes, especially when it comes to space. This was seen in his first Blake’s 7 Book Avon: A Terrible Aspect published in 1989 in which he thought, for example, the Clouds of Magellan were actual clouds. Lucifer too was strewn with mistakes or unexplained concepts, such as the whole island planet, rockets making whooshing noises in space, cross winds in space and the classic of a spacecraft in space dropping like a stone when its engines cut out. Nobody expects Darrow to take a degree in physics before he starts writing but surely these could have at least been shown to someone who had that sort of knowledge to correct the errors before they went into publication. That said, he at least seems to have listened to the criticism of the island planet concept as now it is more believable, being an actual planet not just a sliver of one, though how it differs from a normal planet is not explained. He has also sensibly avoided this time talking about anything vaguely scientific when it comes to space. The one exception was when on a planet on which they could see because of “reflected starlight”. We were not told off what the starlight was reflected nor why the starlight could not provide illumination directly. Is Lucifer: Revelation any good? This is better than Lucifer in that we have a story that keeps going, and at a breath-taking pace. However, there are large chunks of uninspiring dialogue that seem to have been written in a hurry. The non-dialogue parts often read like a report rather than a novel. Orac is a problem. It seems to have been suddenly gifted with more human-like features, whether it is snorting or grunting and sometimes chuckling and laughing. Its conversation is at times chatty. While this is nothing like the Orac we see in the TV show, its comments do provide some much needed light relief and a few laughs, whether intentional or not. The introduction of a fuel shortage about two-thirds of the way through seemed a bit like a clumsy plot device to drive the story to its end. This is a shame as it could have had a dark influence on the whole novel if it had been mentioned earlier. A slightly annoying proofing error at one point sees the scene change almost literally mid-dialogue. That said, this is probably the best of his novels so far, but it still could have done with some serious editing and a little more care. Lucifer: Revelation (ISBN 978-1-78178-268-2, 224 pages), published in 2014 by Big Finish. Cover art by Anthony Lamb.